Illumination, the studio that brought you those cute yellow minions, has delivered their take on the Dr. Seuss classic holiday tale. 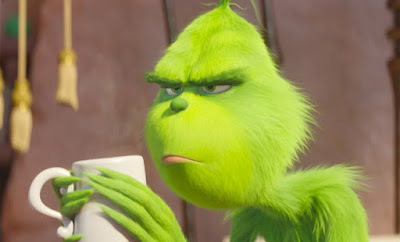 The Grinch is the story of the grump guy with green fur living just outside Whoville. See his heart grow three sizes as he learns the value of friendship and Christmas spirit. 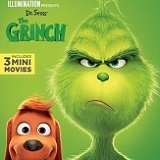 Narrated by Grammy Award winner and Oscar nominee Pharrell Williams, Dr. Seuss’ The Grinch stars Academy Award nominee Benedict Cumberbatch (Dr. Strange, “Sherlock”) as the infamous Grinch, who lives a solitary life inside a cave on Mt. Crumpit with only his loyal dog, Max, for company. 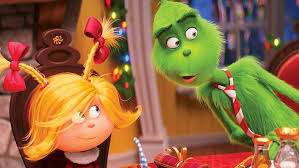 The incredible voice cast includes Rashida Jones (“Parks and Recreation,” The Muppets) as Donna Who, Kenan Thompson (“Saturday Night Live”) as Bricklebaum, Cameron Seely (The Greatest Showman) as Cindy-Lou Who, and featuring legendary actress Angela Lansbury (Anastasia, Beauty and the Beast) as the mayor of Whoville. Funny, heartwarming and visually stunning, Dr. Seuss’ The Grinch is a perfect night in for the whole family! The Grinch (voiced by Benedict Cumberbatch) lives at the top of Mt. Crumpit with his loyal feline companion Max. The film is narrated by Pharrell Williams and stars Angela Lansbury as the Mayor of Whoville. The updated story features Saturday Night Live’s Kenan Thompson as Brickelbaum, one of the happy Whos that infuriates the Grinch. As Christmas approaches, the Grinch’s mood darkens. He hates everything about the holiday and everyone around him, except for Max. With an empty pantry, the Grinch must head into town for supplies. He runs into a little girl named Cindy Lou Who (voiced by Cameron Seely) who is frantically trying to deliver her letter to Santa. She isn’t asking for toys or candy, instead she seeks help for her overwhelmed mom. On this visit, the Grinch also sees Brickelbaum. Brickelbaum has announced that this Christmas will be bigger than ever. His decorations are over the top and his home is filled with Christmas spirit. Immediately the Grinch springs into action, to steal the holiday right out from under the Who’s. This iteration of The Grinch, offers some backstory you have not seen before. Specifically when it comes to Cindy Lou’s mom and her struggles. As you watch the Grinch empty the homes in Whoville, you’re aware that in the end he’s got to put it all back. I wondered how disturbing this idea is for little ones who might not know that a happy ending is coming. There is humor and fun, colorful animation. It feels more Seuss-like than other Grinch tales in that respect. Benedict Cumberbatch chose to make this an American Grinch. He sounds incredibly different without the British accent, and he loses some of his personality. Pharrell Williams, as narrator, gives everything and updated feel. For some people that’s a good thing. For others, it’s not. When you’re expecting to hear someone like Sir Anthony Hopkins it’s hard to adjust to a less regal voice. Overall, the film was enjoyable and the cast was good. Personally, I’ll probably leave this on the shelf until next Christmas. It’s a holiday movie and it will be reserved as such. This isn’t my favorite Christmas story and this version is not my favorite version of The Grinch. It was still enjoyable and worth owning. 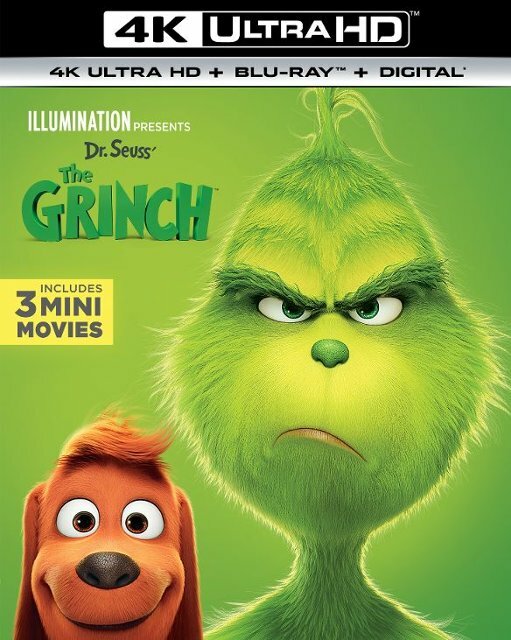 The UHD release of Dr. Seuss' The Grinch was upscaled to 4K. The 4K is an upgrade in picture and color from the included Blu-ray. Fur, snow and other textural elements show the modest improvement but neither format is truly lacking. The color grading and vibrancy is where the 4K UHD release shines. The sky is bluer, the grass greener and the snow whiter in ultra-high definition. 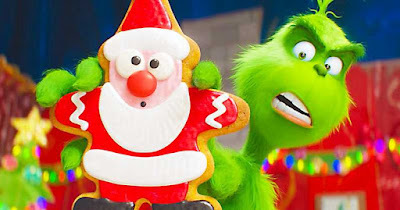 The Grinch’s Dolby Atmos soundtrack features a robust score by Danny Elfman. 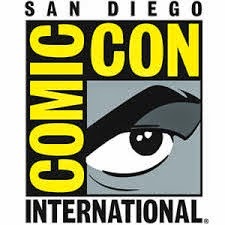 The sound effects are authentic and action is well balanced. Dialogue is consistently intelligible. The Grinch’s home in Mt. Crumpit offers a hollow feel, adding to the authenticity. The audio presentation is impressive, and similar on both Blu-Ray and 4K. 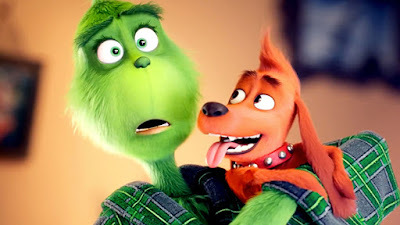 From Green to Screen (6:19): This featurette includes interviews with cast and crew and explains how this Grinch tale came to be. Illuminating The Grinch (4:55): A look at the Dr. Seuss style bringing to life the animated feature. Who's Who in Who-Ville: An interactive feature offers the chance to select a character and view the following: Character Profile, Animation Tests/Walk Cycle, Progression Reel, and Photo Gallery. My Earliest Grinch Memories (3:10): Cast and crew discuss their introduction to and feeling about the Grinch. 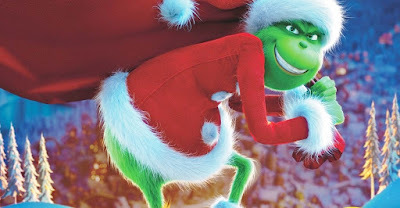 Grinchy Gadgets (3:21): A brief look at the Grinch's equipment. (1:55): "You're a Mean One, Mr. Grinch" with on screen lyrics. (2:48): "I Am the Grinch" with on screen lyrics. Songs from His Little Heart (3:25): A look at what Danny Elfman brought to the project and the impact of the music. Any Who Can Draw: A tutorial that teaches you to draw The Grinch (3:05), Max (2:04), and Fred (2:11) featuring Head of Story Mark O'Hare. Christmas Around the World (2:20): Christmas traditions from around the world. Cindy-Lou's Yule Log (8:02): A fireplace scene with music and dialogue, regularly interrupted by that pesky Grinch. Production Babies (1:16): A list of the crew babies who were born during production. Yellow Is the New Black (4:17): A minion prison break mini-movie. The Dog Days of Winter (4:04): Max is a good friend to the ailing Grinch. Santa's Little Helpers (3:52): Minions bound for Miami end up in more frigid conditions and find themselves in training to be Santa's elves. The Making of the Mini-Movies (5:53): Cast and crew talk about making the short features. Dr. Seuss' The Grinch is technically impressive on both Blu-ray and 4K UHD. It includes a healthy list of fun supplemental features. This re-telling of the Grinch legacy is bright, colorful and is both sad and cheery. If you love Jim Carrey’s live version, this won’t take its place. It does give you another animated choice for next Christmas. I recommend the purchase for those looking for an updated take on the classic.